In our Terpenes 411 column, we’ll be talking about terpenes, which are aromatic compounds found in every plant, including marijuana. Not only do they give our favorite strains their distinctive scents—they also play a major part in providing therapeutic effects. There are over 100 different terpenes in the cannabis plant, and while each has its own benefits, when they come together with THC, CBD, other terpenes, and our own biological makeup, they interact synergistically, resulting in what is known as The Entourage Effect. In the coming weeks, we’ll continue delving into, and providing a full-fledged education, about this buzzword that you’ve likely been hearing about all over the place. Terpenes can bring a lot of desirable qualities into the mix for some strains of cannabis, from physical benefits (anti-fungal or antibacterial properties, for example) to mental improvements, like helping to reduce anxiety and depression. That’s definitely the case with humulene, a terpene with a woodsy, earthy, even spicy smell or taste, sometimes likened to hops-heavy beers. 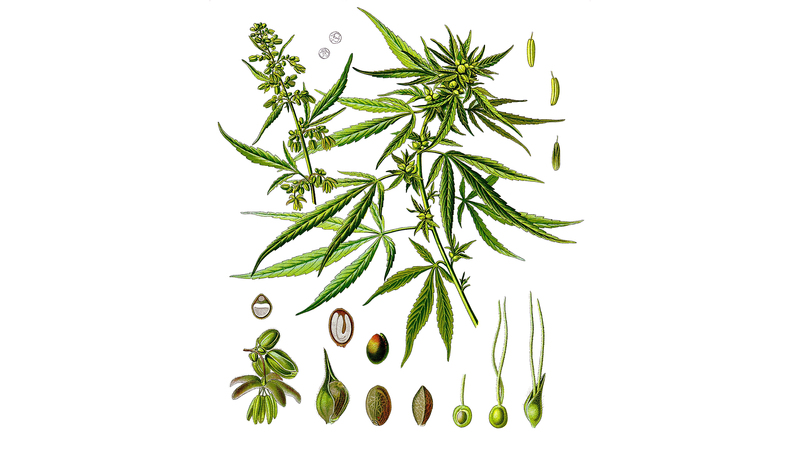 Humene is one of the key components of cannabis’ scent profile (as are pinene and myrcene). It’s also found in sage and ginseng, and is thought to address a wide array of issues. Better still, there’s the pretty miraculous possibility that humulene has anti-cancer qualities, as is thought to be found in another key terpene, limonene, which brightens up certain cannabis strains with a citrusy scent or taste. Another overlap with limonene? Humulene is an anti-bacterial, which was discovered during a 2006 study that examined the essential oils of balsam fir trees and determined humulene was a key compound for fending off bacterial infections. It is an anti-inflammatory, too, as a number of studies from 2007 to 2009 showed; it also can function as an analgesic. A particularly unique trait about this terpene is that it’s thought to be an appetite suppressant; akin to THCv, humulene could one day be incorporated into weight loss strategies or treatments. Look for higher concentrations of humulene in cannabis strains like Headband and Thin Mint GSC, and ask your local MedMen sales associate to guide you towards the humulene-heavy options. Given the strong suite of promises, it’s a multitasking terpene worth seeking out.